Casual Game Insider, a premier board gaming magazine, is having its annual funding drive on Kickstarter right now. 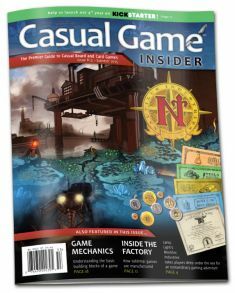 Chris James of Casual Game Revolution, CGI’s publisher, sent me a link for a pdf of a free copy of Casual Game Insider for me to share with you! Here’s that link – FREE ISSUE of Casual Game Insider. Check out the free issue then head over here – CGI KS – to support this quality gaming publication.